Editor’s Note: This article contains an addendum to our initial report including photos and video from the campaign to #SaveShadowhunters. Shadowhunters fans continue to be one of the most awesome fandoms on the internet. Following the show’s surprise cancellation earlier this month, thousands of fans came together to create a ‘Save our Show’ campaign with a difference. To date, the group has collected over 130,000 signatures on a Change.org petition to let other networks, cablers and streamers know there is still an active fanbase out there who would very much like the show to continue outside of its former home at Freeform. However, the dedication of these fans doesn’t stop there. The group has also pledged over $9,000 to The Trevor Project, an organisation that provides crisis intervention and suicide prevention to lesbian, gay, bisexual, transgender, and questioning teens and young adults. Shadowhunters was a rare beast among recent broadcast TV shows in that it created space for a grounded love story between two LGBTQ characters, Alec Lightwood (Matthew Daddario) and Magnus Bane (Harry Shum Jr.), that was neither sabotaged, nor ended in a dissatisfying yet familiar breakup/death trope seen in myriad other shows from Supergirl to The 100. In fact, #Malec was often portrayed as the stable emotional core of the series, while other straight couples bore the emotional brunt of sudden deaths, breakups and heated arguments. That the fans have singled out The Trevor Project is telling, and illustrates the compassion and generosity of this unique fandom. “Alec and Magnus inspire so many people including myself and I would not have the same confidence without them… they’re not done telling their story,” as one fan eloquently put it. While there is still no word regarding the show’s pickup by another source, fans can expect 12 new episodes to air in the Spring of 2019, including a two hour season (or series) finale. “We are very proud of Shadowhunters, a series that broke new ground in the genre world and became a fan favorite,” the network said in a cancellation statement. The show averaged almost 400,000 weekly viewers during the first half of its third season run, a figure that is sharply down from season 2, and further comments from network PR cited “economic reasons” and Constantin’s deal with Netflix deal with as factors in the cancellation. Update: As part of their efforts to see Shadowhunters picked up by another source, dedicated fans came together late last week to organize a fly-by over Netflix HQ in LA. 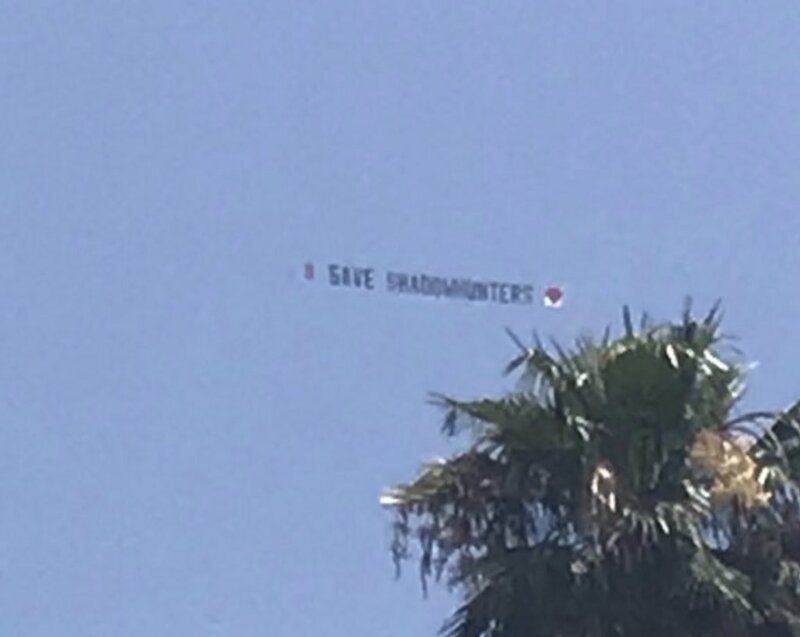 The plane circled the building for a couple of hours, with the hashtag #SaveShadowhunters prominently displayed. Catch the photos from the event below, and a video through this link. Many thanks to @idrisbound33 for helping us get the news out.